Since helping to propel the success of the brand new Xbox gaming system back in 2001, the Halo series has been a staple of Microsoft’s Xbox platform. And just as the first game, Halo: Combat Evolved, was released exclusively for Xbox, the Halo 5: Guardians game is exclusively for Xbox One. So if you’re like me and still on Xbox 360 (because my favorite LEGO games aren’t backwards compatible yet!) then you’ve missed out on the Halo 5 in-game cinematics, which have been nominated for an MPSE award for Best Sound Editing and Music. 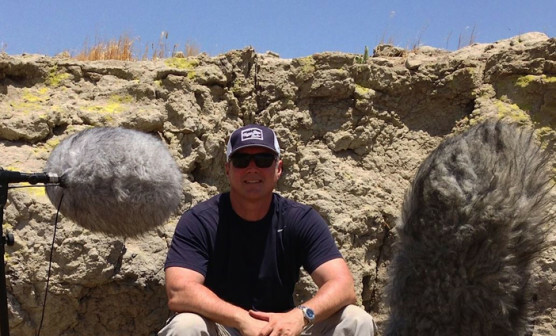 Here to share some specifics is Warner Bros. supervising sound editor Bryan O. Watkins. He and co-supervising sound editor Mitchell Osias crafted the Halo 5: Guardians cinematics’ sound. Is Halo 5: Guardians your first Halo game experience? Yes, Halo 5: Guardians was our first large-scale project with Microsoft. I started playing Halo 2 with my son, so I have a lot of respect for the franchise and was very excited to partner with 343 Industries on Halo 5. This partnership included voice-over casting and recording, field sound effects recording, character and cinematic Foley, cinematic sound design, and mixing. Even the motion capture for the cinematics was facilitated here at the WB lot. What was your biggest challenge in designing the sound for the cinematics? The audio team at 343 Industries had been working on the project for well over a year before we got involved. So our job was to continue and enhance their vision in the cinematics. Audio director Sotaro “Tajeen” Tojima has a very detail-oriented approach and asked us to cover everything we saw on screen with sound. This was a considerable task given the busy action sequences in the Halo world. So for me, as cinematic sound supervisor, my challenge was to balance detail and clarity. Since there is a whole Halo world already in existence, there must be a library of Halo sounds right? Were you able to use any existing sounds for the cinematics? Absolutely! The sound design team at 343, led by senior sound designer Kyle Fraser, had all the in-game assets for Halo 5 and shared an impressive palette of well-crafted sounds for us to build upon. We worked primarily with their weapons, vehicles, and special character sounds including the Guardian and Warden sound effects. The character Foley was performed by John Roesch, Alyson Dee Moore, and Shelly Roden here at WB. My team worked closely with 343 to build out these Foley assets, which were big players both in-game and in the cinematics. What sounds did you create for the cinematics? We wanted the cinematics to dovetail into the in-game experience, so we used the 343 assets as often as possible for continuity. When we saw the incredible visual detail of the cinematics, we knew we would need to build out some of the in-game assets to fill a 5.1 surround field. The Guardian is a good example of our design process. The Guardians are mythical, spiritual, and powerful beings. They are enormous and have the ability to warp travel throughout the universe. The Guardian assets were delivered in stereo so we added low-frequency effects, portal sounds to cover its arrival and departure events, and enhanced its metallic tendrils. This amped up the power and detail. The game opening is a very busy cinematic in which we created tonal and motion sweeteners to cut through the music and chaos of the battle and established a cinema-like aesthetic with sophisticated and delicate user interface sounds. Did you do any fun field recordings for the Halo 5 cinematics? One of my specialties is setting up large-scale recordings that fulfill in-game asset requirements. For Halo 5, we recorded weapons here at the WB Studio lot to capture a real life urban acoustic signature. We also did a large debris recording session including dirt, metal, and wood destruction. Additionally, we did a bullet whiz by and impact session. Sound effect recordist John Fasal and my team were all impressed with the level of expertise the 343 team had with field effects recording. Were you able to work with the music while designing sound for the cinematics? Yes, we had the music. It always helps sound designers to know what the music is doing at any given moment. This way we can design sounds to work with the music or step back and make room for the music. Did you have a favorite cinematic to design? The opening! Epic! Especially when we heard Tajeen had a smile on his face after hearing our work. Did you handle the mix on the cinematics too? Tom Ozanich mixed the Halo 5 cinematics. He is an incredible re-recording talent as well as an A-list sound designer. Tom brought Academy Award level experience to this project. What was the biggest challenge on the mix? Tom’s biggest challenge was the same as mine, creating a powerful balance between detail and clarity in the busy Halo universe.